Yogyakarta – Wednesday, March 27 2019, Master of Science and Doctorate Program, Faculty of Economics and Business, Universitas Gadjah Mada held a guest public lecture entitled “Changes in Economic Stability Policy: Post the 1997/1998 Economic Crisis.” The guest lecture on this occasion was presented by Prof. Dr. Anwar Nasution, and moderated by Prof. Dr. Catur Sugiyanto, M.A. The event was held at the BRI Auditorium, 3rd Floor, MD FEB UGM Building, and was attended by students of the MD FEB UGM Program. 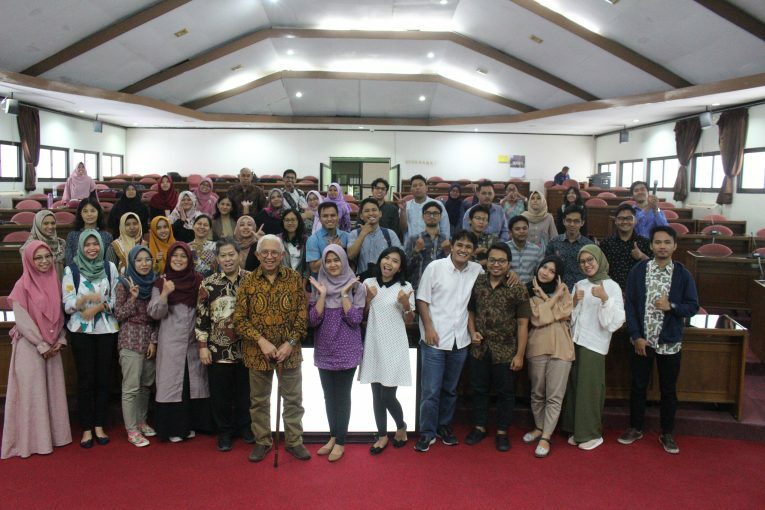 Prof. Anwar Nasution explained the development of monetary policy since the 1988 Crisis until now. In the New Order era, how much monetary policy was under government control. The rupiah exchange rate is tightly managed. Interest rates on loans and repair deposits are also under the control of the government. Many credit programs are channelled by the government through the banking sector so that economic stability becomes more secure. Bank Indonesia is a government bank that meets the government’s financial needs. If government revenues do not meet the target, the government submits a loan to Bank Indonesia. Government loans to Bank Indonesia are carried out by printing new money. The stability policy then shifted into the banking sector deregulation policy. Interest rates are left to the market mechanism, and the exchange rate is released, as well as foreign debt by the private sector. Indonesia’s economic growth was driven by the deregulation policy. However, it saves destructive power. First, export growth and foreign debt make the exchange rate more openly following market movements. Second, short-term foreign debt is often used for long-term investments. Finally, a lot of infrastructure development involves Suharto’s cronies, so many feasibility studies are sacrificed. The fragility of the economic structure resulted in the inability to handle the 1998 Monetary crisis. The era of reform, through the direction of the IMF, the government embraced deregulation. Two things are underlined in this era, namely decentralization/regional autonomy and the establishment of the Financial Services Authority. The reform era was also marked by global macro conditions that lacked conditions that negatively impacted economic growth. For students, policy development is interesting because Macro theories such as Taylor’s rule, Phillips curve, Okun’s Law and others are more relevant to the Indonesian economy.